Cats are the reason Instagram was invented. We've teamed up with Fresh Step Clean Paws to put you in the picture with them. 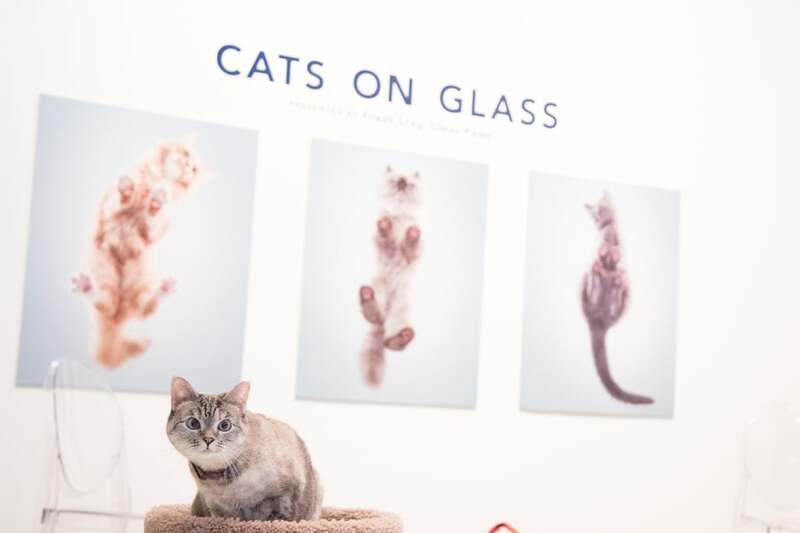 If you agree that it's a cat's world and we're all just living in it, then you need to stop whatever you're doing right now and head to NYC's cutest pop-up ever, the Cats on Glass Gallery. 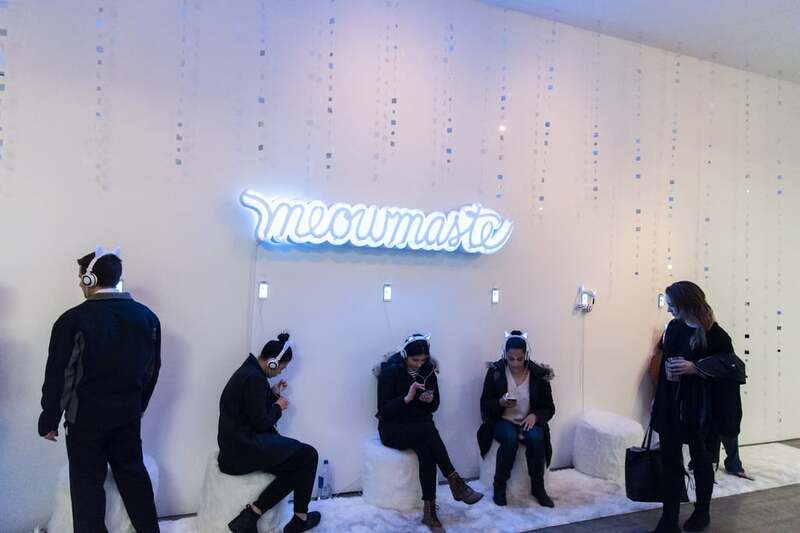 This cat-tastic interactive exhibit is the stuff of dreams, with rooms to play with cats, meditate to the sound of purring, selfie like your cat would if only it had opposable thumbs, adopt a cat, play like a cat, and even turn into one (seriously, your Insta needs this)! I got a cat's eye view of the whole experience, which runs through Monday, Feb. 19, at 524 W. 26th St. and 10th Ave., near the High Line. Here's why I'm going back for more this weekend. Kate Walsh, checking out every cat's dream accent wall. Did you know that there are 297 million cat-related posts on Instagram? Prepare to double that the second you step inside at Cats on Glass. 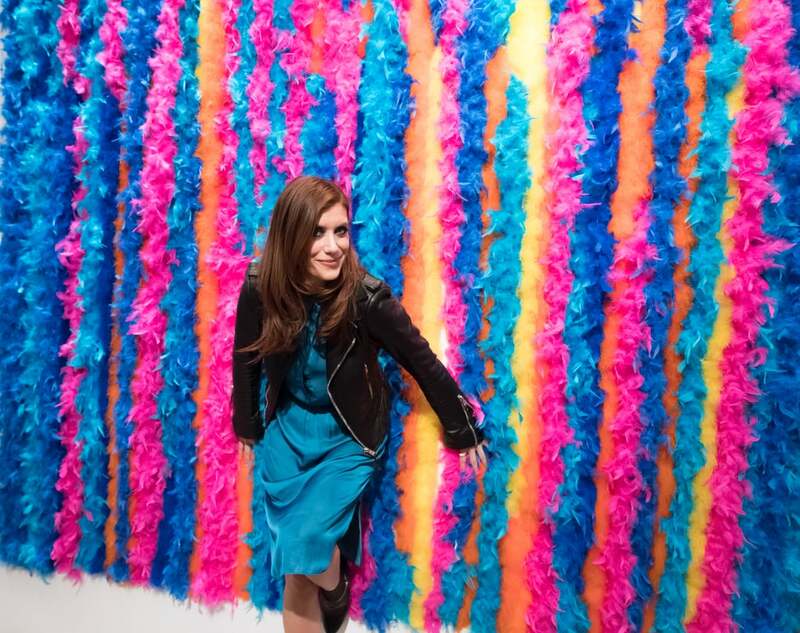 You're met with three 7-foot-tall glittery cats and a giant boa wall to selfie with — and this is just the warm-up. All the artwork you see is produced locally, proving that cats really do spread positivity. Best of all, every #CatsOnGlass Instagram post and Story posted from the event triggers an automatic donation to the Humane Society of New York, so get snapping. All the featured cats are adoptable — and adorable! But of course, the real stars here are the cats, cats, and more cats. The Humane Society of New York has teamed up with event organizers Fresh Step to further the mission of finding forever homes for the more than three million cats and kittens that enter shelters each year in the United States. On site, you'll find adoptable bundles of cuteness that you can meet from literally every angle! 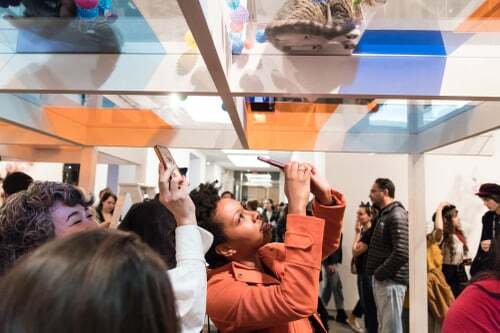 Meet twenty of them face to whiskers in the fully kitty-ed out playroom, or watch a parade of kitties take the floor in the event's pinnacle, Live Cats on Glass — a clear, elevated "catwalk" where curious kitties and their adorable toe beans can be viewed, and squealed at, from below. 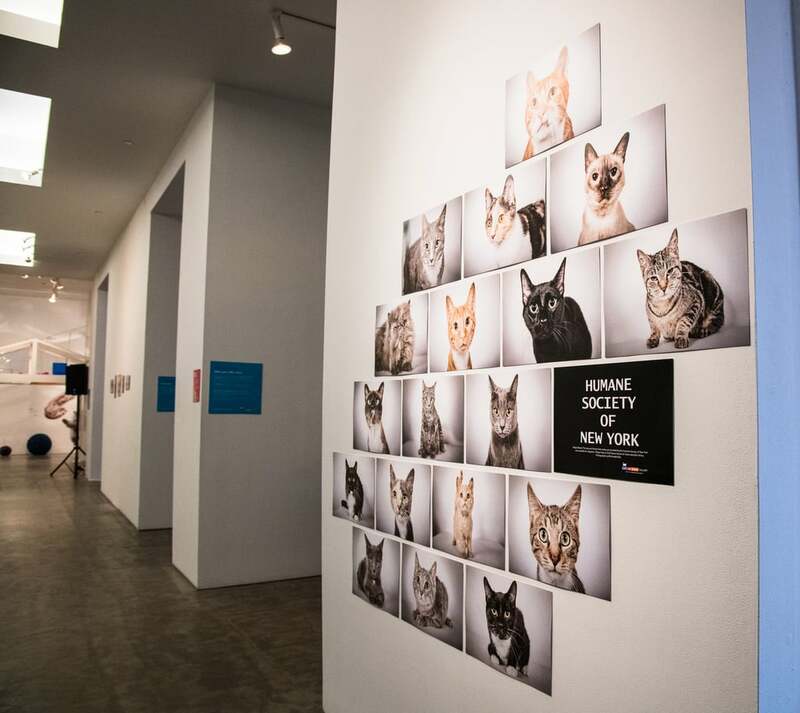 The visually stunning exhibit shows the benefits of Fresh Step Clean Paw's new low-tracking litter formula, which aims to remove one major barrier to adoption: only half of shelter cats each year in the United States are adopted, in large part due to litter box rejection or litter mess. How could anyone say no to these little faces!? 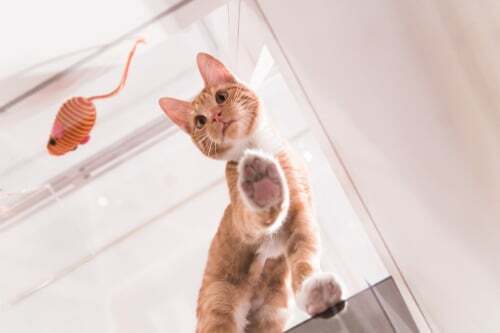 Cats on Glass completes your feline metamorphosis with two interactive rooms that will have you sprouting whiskers and sipping from a bowl by the end. In the meditation room, close your eyes and listen to the sound of a guided meditation, taped on a mountaintop in Brazil (true story), overlaid with soothing cat purrs. Also re-create playtime in the Pom Pom Room, filled with 30,000 soft, colorful pom poms by local artists, plus a giant costume cat head that just begs for photo ops. Special guest Nala opened the exhibit on Thursday to a round of ap-paws. "Kitten Lady" Hannah Shaw and celebre-kitty Nala Cat declared the Cats on Glass Gallery open on Thursday evening. Visit www.catsonglassgallery.com to learn more and reserve a spot at the gallery this weekend. And, if you aren't in the NYC area, join in the fun by checking out the virtual tour via Facebook live. See you there!